We are very excited to be offering some Ski Courses this season within the UK. Based at The Snow Centre in Hemel Hempstead, Sally Chapman and Dave Peek will be heading these courses, so if you fancy coming along please do contact us! COURSE DATES presently on offer 16th and 23rd November 2010 – Tuesday evening sessions from 7.30 pm – 9.30pm – £45 for two hour session to include tuition, slope and equipment hire fee. There will be a variety of topics. ‘Drills and Skills Sessions’, ‘Short Turns/Bumps Sessions’, ‘Ladies Sessions’. ‘Ski Race Fun Sessions’. 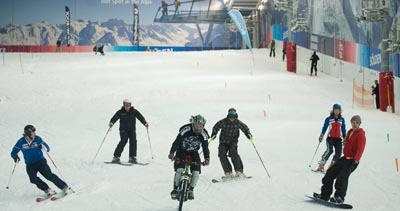 Further details of The Snow Centre can be found at TheSnowCentre.